Cast: Heo Jung Eun, Oh Ji Ho, Park Jin Hee, Oh Yoon Ah and Lee Jee Hoon. Mo Hwi Cheol (Oh Ji Ho) is a con artist without a single care of anyone but himself. When he is arrested for selling a fake painting to mob boss, his two partners are saved from the mob boss, but don’t know how to get him out. Not until Geum Bi knocks on their door. 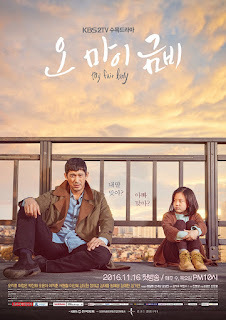 Yoo Geum Bi (Heo Jung Eun) is a 10-year-old girl who has been abandoned by her aunt, leaving her only with an address and a name to go to: Geum Bi’s father, Mo Hwi Cheol. After saving her father from jail time, Geum Bi starts living at Hwi Cheols House, much to his displease. While living there she manages to ruin one of their cons: a recluse rich heiress by the name of Ko Kang Hee (Park Jin Hee). When I heard about this drama I was 100 percent sure that I would love it. And I was right. It has all the good stuff in it: heartfelt story, great acting and most of all it is very real (as real as a drama can get). I like that they chose beginner father Oh Ji Ho for this role, as I would imagine him being that fatherly with his child in the future when she gets that age, which makes it even more cute. As the female lead goes, I gotta say I don’t really recall her from other roles, so this was just another female lead doing the very typical Korean female lead kind of acting, and a very typical to be honest. I don’t really feel the Korean female actors have any variety of characters... They all seem alike. The little girl though, she was great! I was quite amazed while watching – though I can’t remember if I’d seen her before. Anyways, I loved this drama and I would recommend it to anyone.